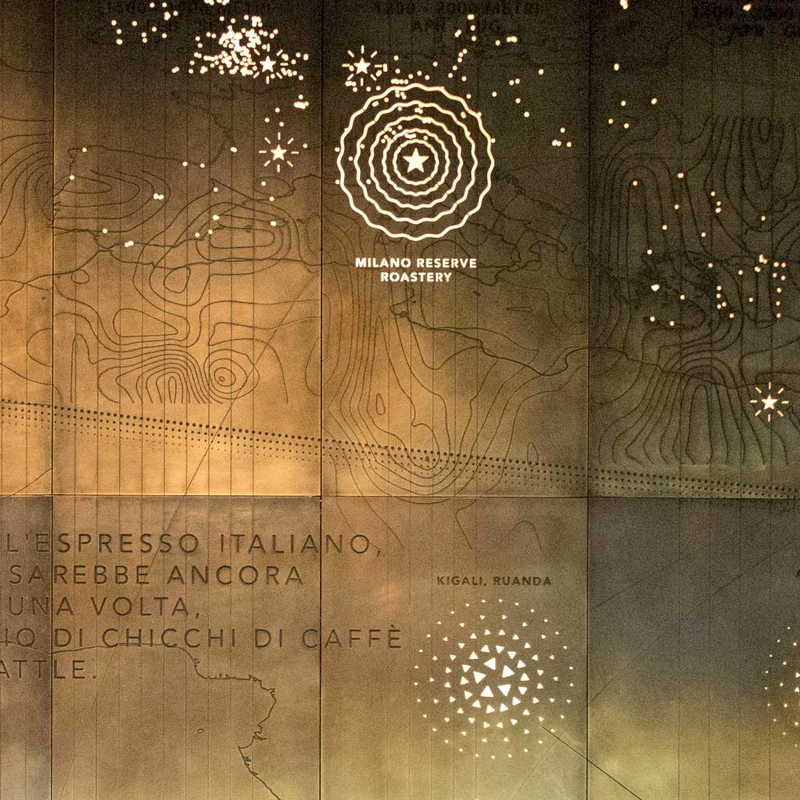 To celebrate Starbuck's first ever store in Italy, the Starbucks Reserve Roastery Milan in Piazza Cordusio, we designed a massive, augmented-reality-enabled brass wall depicting Starbucks' history and coffee-making process. 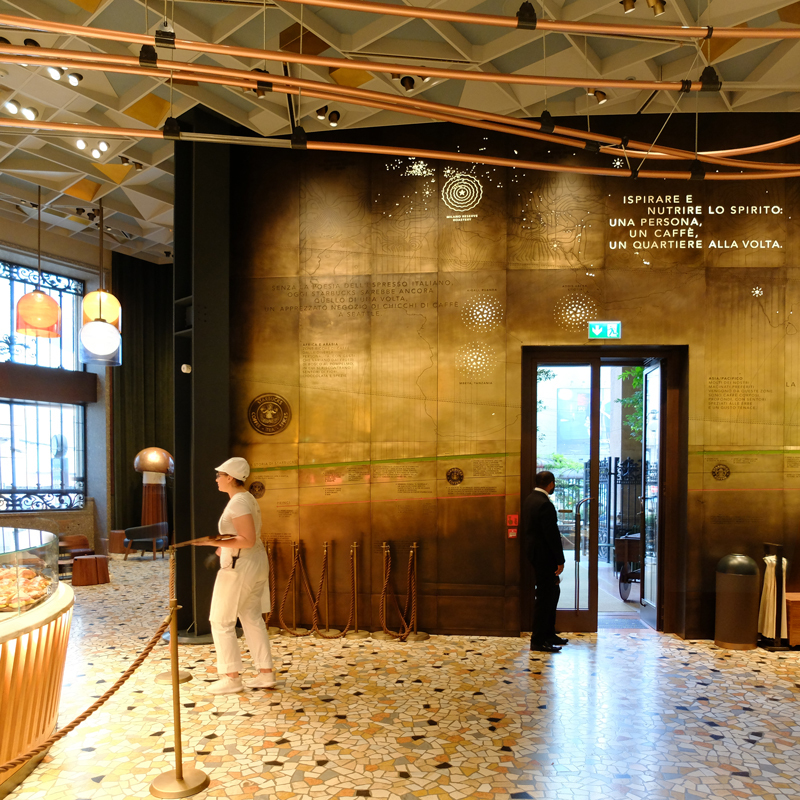 In September 2018, Starbucks opened their first store in Milan: a Reserve Roastery located inside the historic Poste building in Piazza Cordusio. 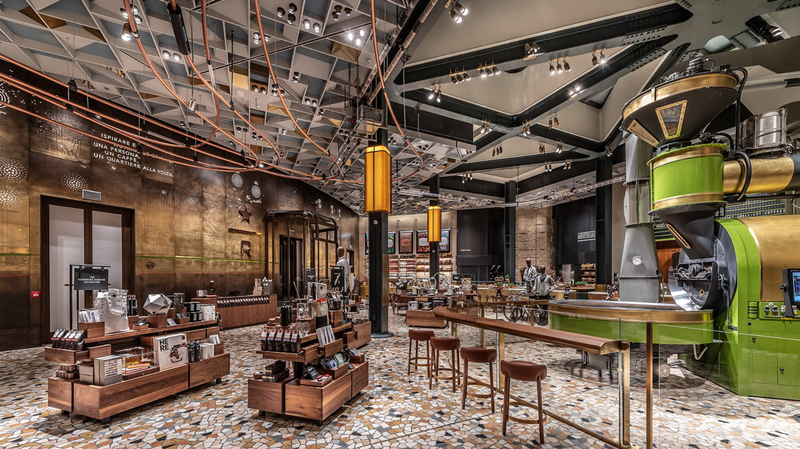 Arguably the most beautiful Starbucks store to-date, the new Milan Roastery is designed as an homage to the Italian espresso culture that inspired Howard Schultz 35 years ago to create the Starbucks Experience as we know it now. 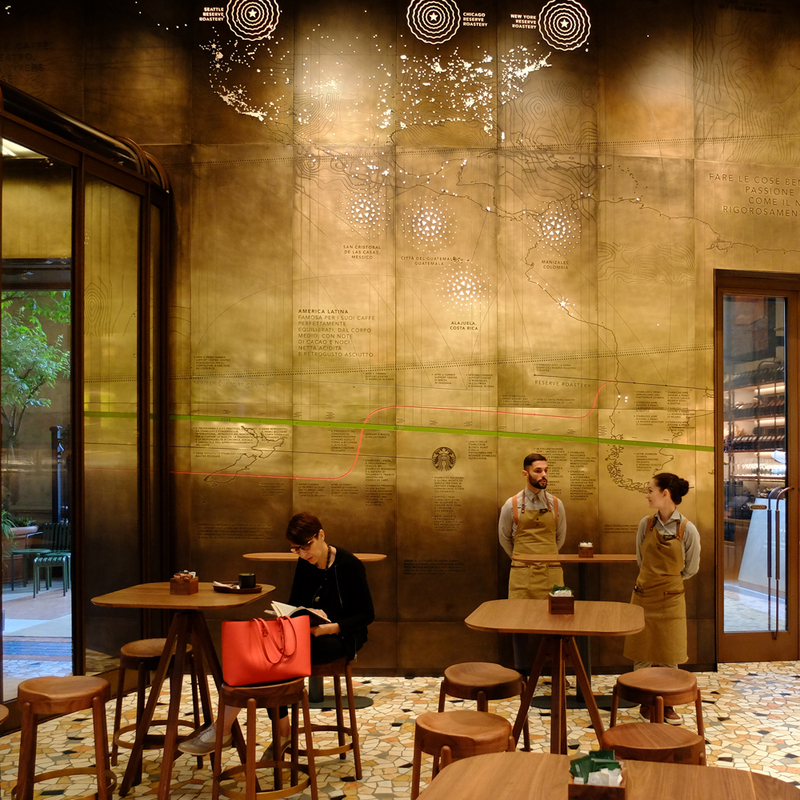 In collaboration with Starbucks, we designed the feature architectural element: a floor-to-ceiling, wall-to-wall visual representation of Starbucks history and its coffee, engraved in brass by local craftsmen. Furthermore, we designed and developed an interactive experience through an AR app that visitors can use as a magic lens to discover three dimensional animations and additional content attached to the wall. The opening of the Milan Roastery - the third worldwide, after Seattle and Shanghai - presents a full-circle moment for both Howard hultz and the company. Offering locally roasted, small-lot Arabica coffee sourced from 30 countries, and freshly baked, artisanal food from local baker, Rocco Princi, the US coffee chain’s entry into the Italian market is a big deal for Italians. 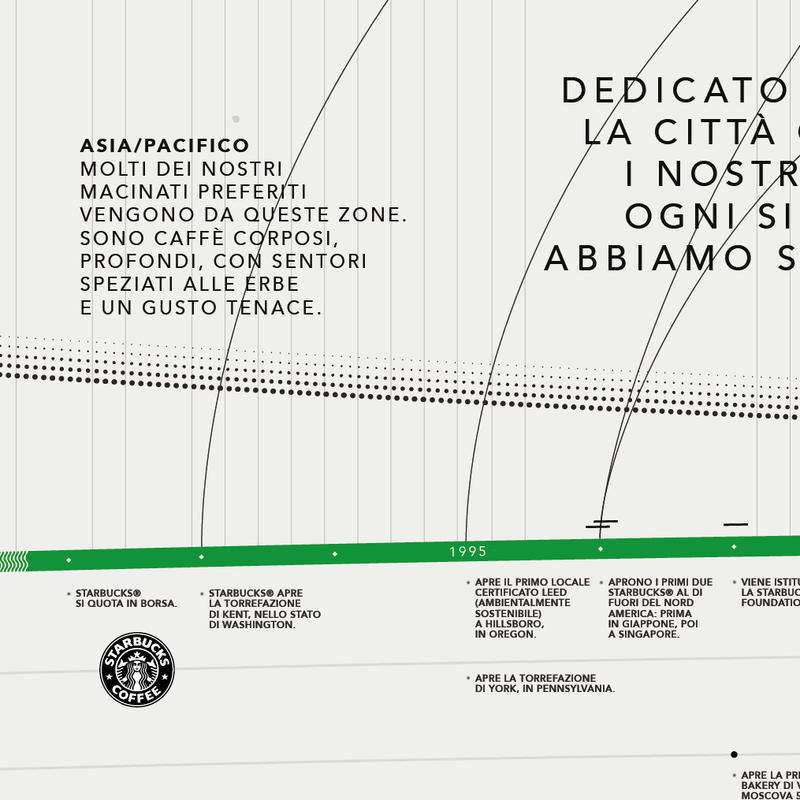 To communicate Starbucks’ story and how the vision for Starbucks came about during a visit to Italy that Schultz paid in 1983, we had the honor to work side by side Starbucks’ executives and the team of architects and artisans who designed and build the renovation for more than 6 months to create a floor-to-ceiling, engraved brass data visualization wall that we enriched with the addition of a digital layer interacting directly with the physical space. 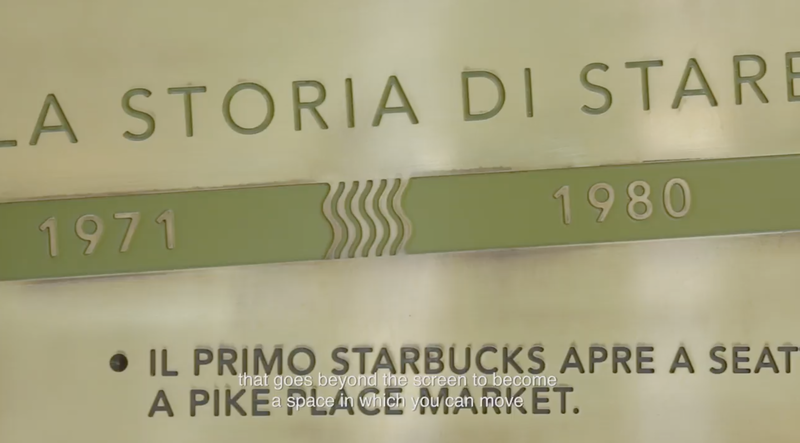 The wall can be read through three overlapping and interplaying layers: the story and journey of Starbucks, the meaningful places in the company’s history and the actual coffee blends. 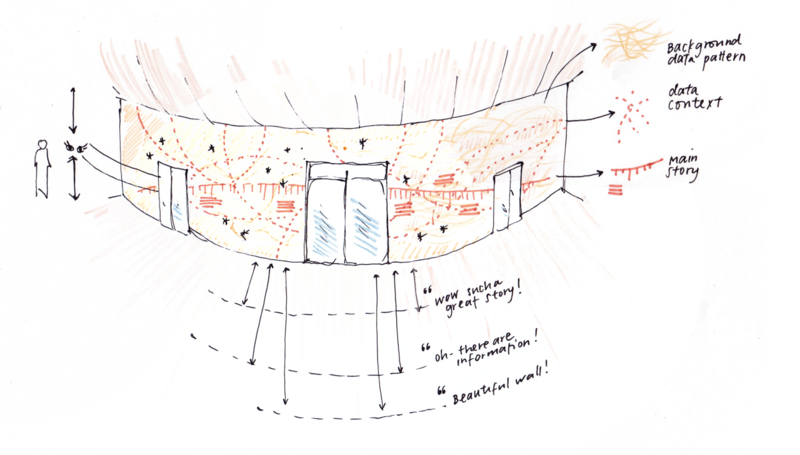 Each layer of information is embedded in the wall leveraging the potential offered by different etching, engraving and brushing techniques, as well as the lighting, to create a landscape that is both cohesive and multi-faceted. A dense and granular visualization presents a main narrative (Schultz’s journey and the story of how — right in this city— Howard fell in love with the Italian coffee culture) over additional datasets that provide a context to it and evoke secondary stories. Design in collaboration with Starbucks Creative Global Design and Innovation. Execution by Starbucks. The Story / This layer is a timeline positioned at eye level that unfolds along the whole wall and contains different narratives related to the most important events of the brand’s story from its origins, the evolution of the logo, the birth of the Roasteries and the Farmer Support Centers, together with baker Rocco Princi’s story. 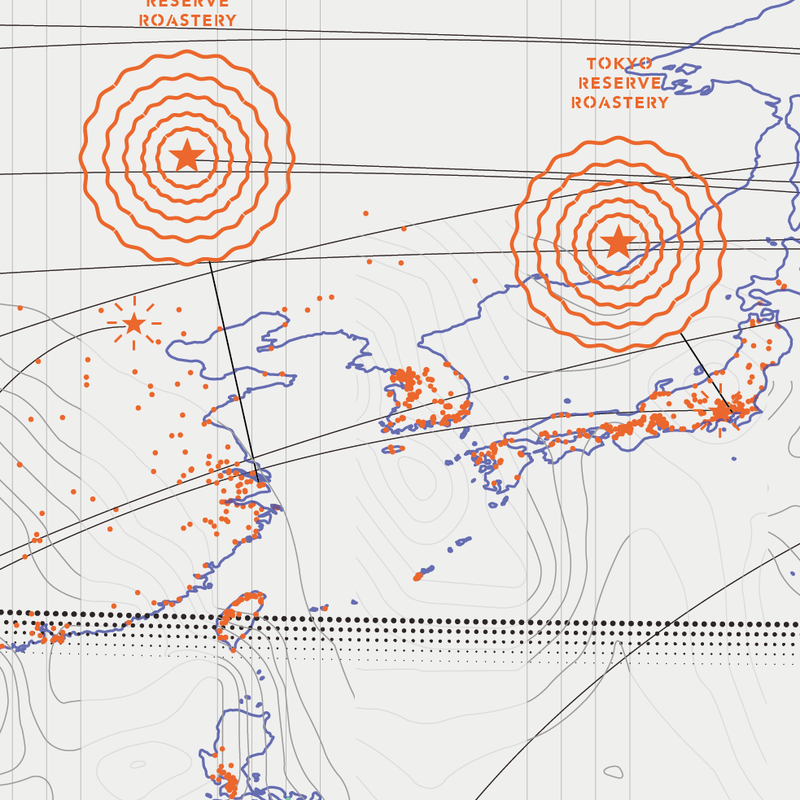 Starbucks in the world / An underlying map explores all of Starbucks’ stores around the world, the meaningful places in the company’s history, the Reserve Roasteries, and the areas in the world where coffee is grown. This is the story of how every lesson learned in every corner of the world makes Starbucks coffee what it is. The Coffee / This background layer of information represents where and when Starbucks coffee is harvested around the world. Each panel is dedicated to a country and the combination of altitude and harvesting seasons creates darker areas within the panel. 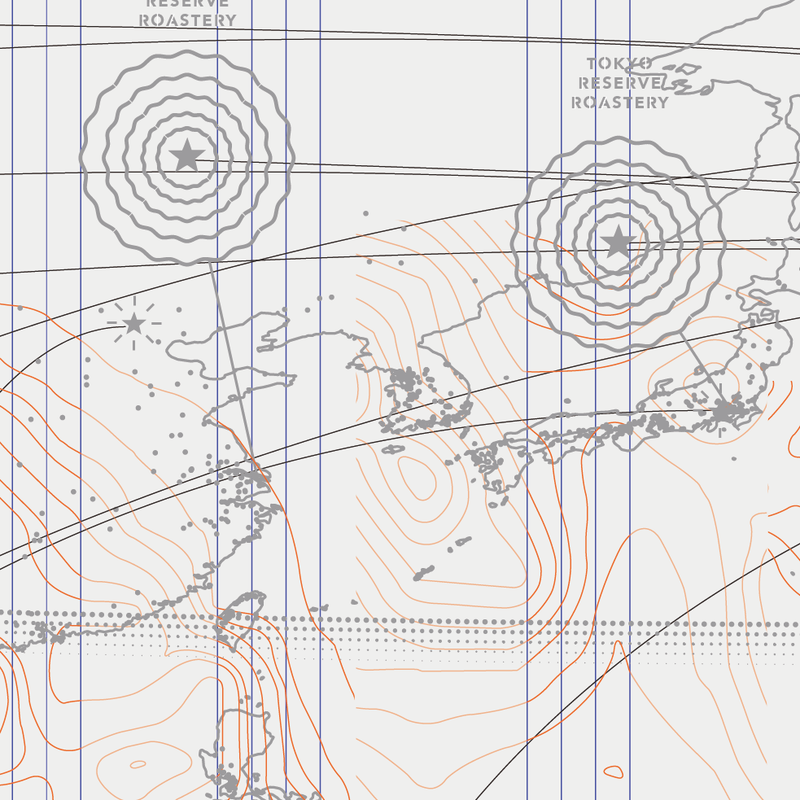 To give visitors a sense of the landscape, we used the real altitude lines of the areas where farms are located within each country. This is the story of each of the single components that make coffee what it is: every step from seed to cup plays its role in shaping the many flavour profiles of all of Starbucks’ blends. 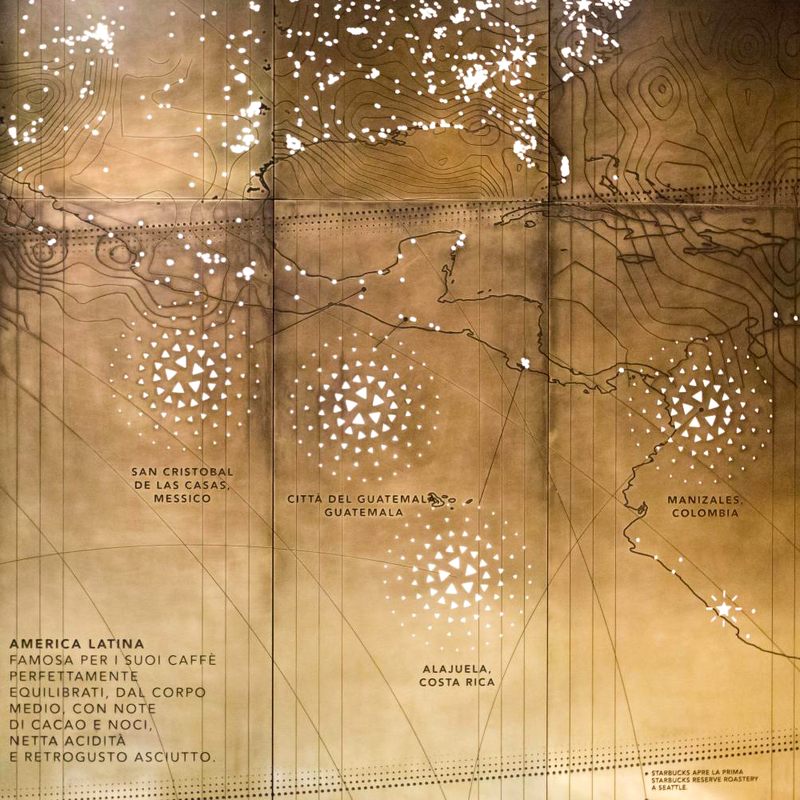 At Accurat we also conceptualized, designed and developed —in partnership with our friends at Monogrid— the Starbucks Reserve Roastery Milano app, adding a digital layer that interacts directly with the physical space. Throughout the Roastery, the physical environment is complemented by an interactive augmented reality (AR) experience, inviting customers to to uncover more about Starbucks Reserve® coffees, the roasting process and the company using their mobile device. Thanks to augmented reality, the wall is turned into a living artwork providing access to extra contents such as videos from farms and roasteries, information on the history of Starbucks and curiosities on coffee culture from all over the world. 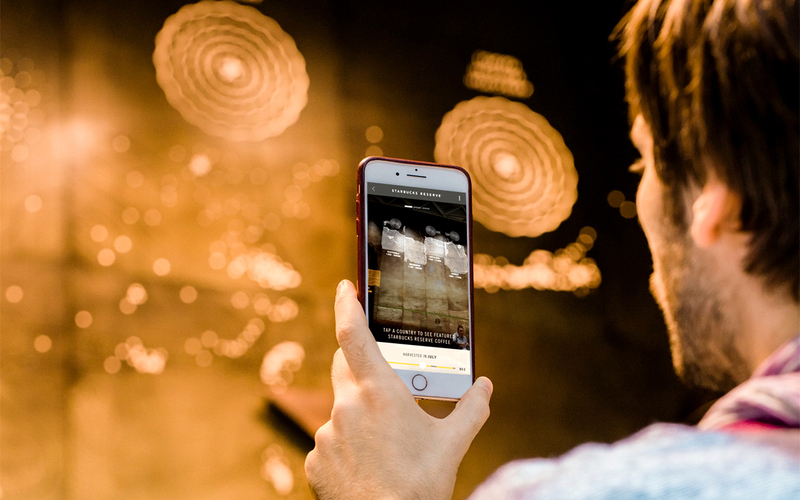 Contents are experienced in an immersive and visual way in the AR view and information is gathered through exploration, allowing the curious users to access more detailed info about the contents of the engraved wall. During the process of design and creation of the brass data wall we faced many technical challenges, the most interesting one being working with a very unique material that was going to be carved, perforated, and polished by local artisans according to our specifications. We prototyped several small samples of brass tiles, that we engraved, inked and processed with different techniques in order to find the most proper way to layer the visual elements that compose the artwork: we iteratively tested the legibility and position of the elements by hanging a 1:1 vinyl print onsite, we monitored the production and placement of the panels, frequently visiting the manufacturer and the Roastery worksite. 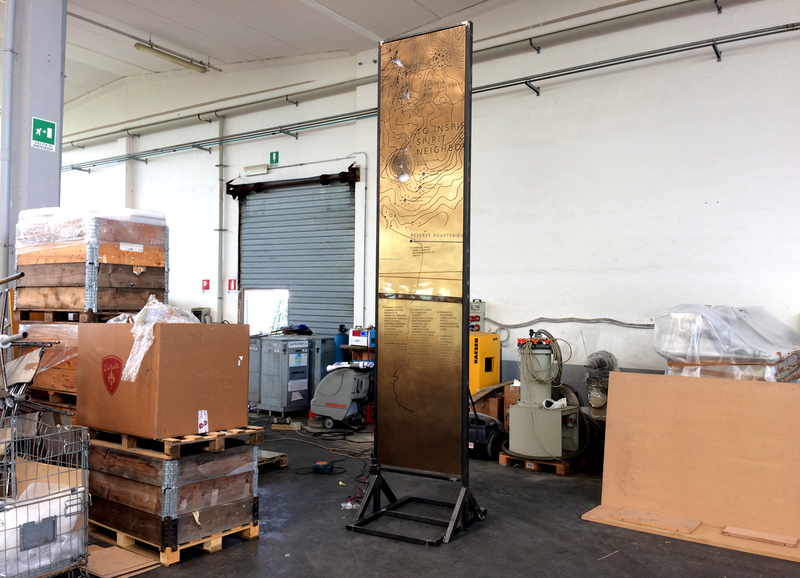 Turning the brass wall into a giant AR marker to activate the digital experience was another very interesting challenge: the material was back-lighted and had strong reflections and curved surfaces that made image recognition techniques hard to use. Working with our partners at Monogrid, we had to carefully study the positions from which customer would use the app to understand the sections framed by the smartphone camera: we then identified the most recognizable and unique elements of the visualization and ultimately calibrated the size and aspects of the visual markers and split the wall in different portions in order to achieve a seamless 3D tracking of the surface. The wall is located right after the entrance of the 2,300-square-meter (25,000-square-foot) Reserve Roastery, and serves as a ‘welcome’ experience, inviting customers to follow the story of Howard’s journey - both physically and through the AR app - and to learn how it started from Milan and how it’s finally coming back to a full circle after 35 years. The evocative data wall paints the picture of a grateful ‘thank you’ note to the city, permeated by the the scents and rituals surrounding the ‘Milanese’ coffee experience, for which Howard fell in love.